It’s the time of the year to start thinking about hill climb training. Whenever I start to do hill climbs in summer, there’s always part of me that thinks – why do I do this? Perhaps this will be my last year… But, after a few weeks, these thoughts fall away. August is a gentle introduction to hill climb training, not 100% all out efforts, just a few unstructured rides – up and down different hills. If possible a chance to get into some different terrain before the more specific intervals up the same local hill. After the end of TT season, it’s time to get used to the road bike and climbing up steep hills, with lower cadence, and using the whole body to drag you up the climb. It’s all very different to getting into an aero tuck and maintaining a metronomic cadence for 1-4 hours. My parents live in Menston, which is perfectly situated for hill climb training. You can go anywhere in a 360 degree radius and find innumerable steep climbs to test your legs. Today, I threw a dice on the map and headed off south towards Keighley. I said August is a gentler introduction to hill climb training, but for some reason, my first hill interval of the day – I chose Thwaites Brow a steep cobbled climb from the outskirts of Keighley, which could never be considered a gentle introduction – even with new a Emonda, tailwind and nice bit of sun..
To be honest, I had forgotten how ridiculous this hill is. This is not a neatly maintained cobbled climb like you might find in the Tour of Flanders. 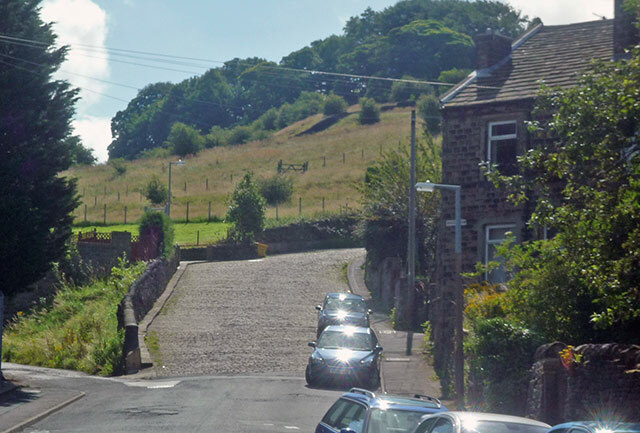 This is a cobbled climb which looks like it was built by a few blokes in a rush to get back to the pub – throwing a few rocks randomly on to the 15% gradient. OK, I might exaggerate a little, but the gaps between the cobbles have to be seen to be believed. When there it this much gap, it seems about 30% of your pedal revolution involves pedalling on air. It’s hard to get the power down. I managed to take photo of best looking cobbles. I’m sure it was much worse when I was cycling uphill! The other thing about the steep cobbled climbs is that the climb seems to have a mind of its own. It’s not a question of picking the right line. The climb throws you off camber and all you can do is hang on. When you’re not eating your own handlebars to keep the cadence going, you might get chance to look up in the forlorn hope of picking a better line. But, even if you can see a slightly milder set of cobbles, you’re never guaranteed to actually make it. In places there is a little bit of patchwork tarmac, but I often ended up missing these anyway. If it wasn’t cobbled, it would be a tough test in its own right, but throw in the mix of random cobbles, and it’s really hard. It’s kind of a relief to get to the top – though, I can’t say I’ll be in a rush to go back. They say heavier riders do better on cobbles. So how does it work for cobbled climbs? At the top of Thwaites Brow I followed my nose – which means that I took random directions and got mostly lost. I headed up Oxenhope Moor and then hoped for the best. An unexpected bonus of getting lost is that purely by chance I happened upon a new climb – Stocks Lane. Thanks to comments on this post Hill Climb Courses is that I found course V9919 is actually Stocks Lane. 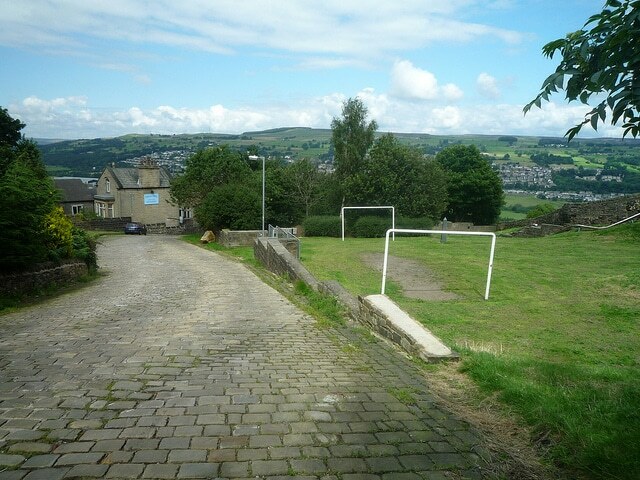 Halifax Imperial Wheelers have a hill climb on this lane on 26/09. – 900 yards of it average grade 10%. It’s a great little climb from the village of Luddenden. It’s a less intense climb than the neighbouring Halifax Lane/Luddenden But, it’s a nice steady 10% gradient with a double switch back. Speaking as a heavier rider I can confirm we are equally rubbish at cobbled and non cobbled climbs of this steepness. My in laws live at the top of this monster, locally known as The Snake and I have regularly arrived at their door incapable of speech after struggling up its coils. I have not tried it but suspect the weight penalty incurred by a full suspension MTB might be worth it to negotiate the chasm like ruts between the cobblestones. I usually cheat and use the smoother pedestrian sidewalk. Enjoying these reviews especially because they are close to home.Thanks. I wonder whether you have come across Coolham Lane on the edge of Earby? Its caught the attention of the ToB organizers this year and is likely to be a make or break part of stage 2. At 2.9 meters length at an average of 6% and the first km twice as steep it’ll be a good place to watch the race.